If you work with geosynthetics, the Industrial Fabric Association International’s (IFAI) annual geosynthetic conference is a must. The conference is the premier industry event for everything geosynthetics, featuring advanced technical sessions and the opportunity to network with key specifiers, influencers and buyers of geosynthetics. This year’s geosynthetics conference is being held at the Marriott Marquis Houston from February 10-13th. As the largest installer, and one of the largest suppliers of geosynthetic materials in the nation, ESI has extensive experience and expertise with geosynthetics. ESI is thus, a longstanding exhibitor of this important conference. Come visit us at booth #605, located close to the front entrance. You should see us once you walk in the conference. We are also happy to provide a 10% full registration discount or a FREE trade show registration. 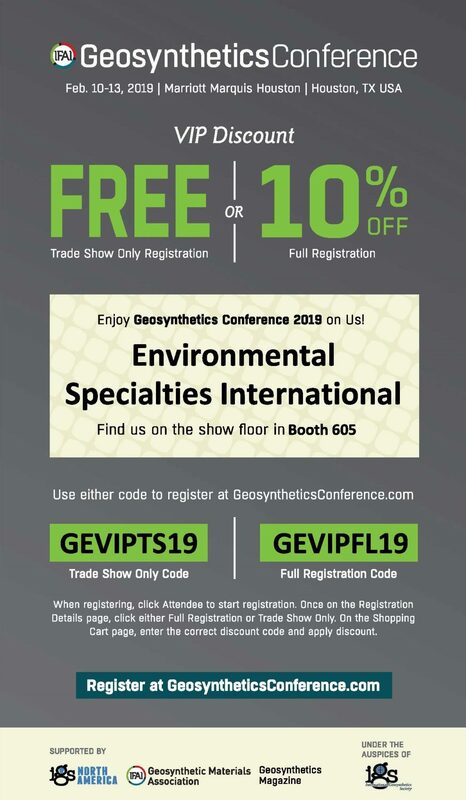 Register at GeosyntheticsConference.com and enter trade show code GEVIPTS19 for a FREE trade show pass, or enter code GEVIPFL19 for a 10% discount on a full registration.